Genever is a Dutch/Holland Influenced Spirit. Only the Netherlands, Belgium and two Provinces in Germany and France are allowed to make “Genever” or “Jenever”. Genever is the national liquor of Belgium and these two countries can now be known as the “Appelation d’origine controlee” when it comes to Genever. It’s officially protected by the European Union as of 2008. In the late 16th century it was first sold for its medicinal properties due to the juniper involved in its distillation process. Juniper berries were crushed, sprinkled with wine and then distilled. Later it was produced by distilling a base spirit consisting of malt wine (from wheat, barley or corn) to 50% ABV in a pot still. Herbs were then added to mask the terrible flavor and it was bottled and sometimes aged. The man believed to have started writing about “Genever Aqua Vitae” was Dr. Philippus Hermanni. Dr. Sylvus de Bouve made Genever to cure kidney and stomach disorders. A fact about Sylvus is that he didn’t actually invent Genever because he was born two years after Genever began to get taxed. Genever consumption would explode later during this time period due to grape harvests and cold waves. Crops were devastated when grape and wine prices shot up. This led to beer and malt production, which was the basis for the Genever distillate. In the 17th century English troops were assisting Dutch soldiers in their way. Before the Dutch would go into battle, they would sip on Genever. This was called “Dutch Courage” by the English and they would bring this recipe back to London to create their own style of spirits, eventually being called Gin. In 1690 the people of London would consume 500,000 gallons of Gin a year! As the 18th Century rolled along Belgian farmers were all ready being “green” with the way they farmed. They used all of their left over material from creating Genever to feed their livestock. They then used manure to fertilize their fields to grow wheat, barley and corn. As it turns out, many farmers became Genever distillers. 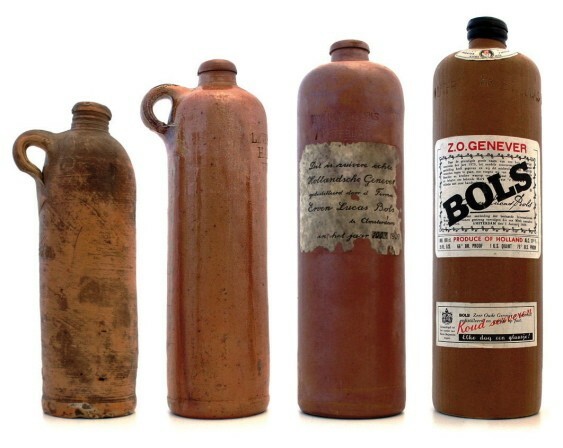 Later as time went on World War I hit Europe and the manufacturing of Genever slowed down. Germans would come to the distilleries and strip them of their copper piping from their pot stills and coils so they could make shell casings. The next blow was in 1919 as the Vandervelde law prohibited the selling of distilled spirits in public places. This turned out to be a small European “prohibition”. Genever took a big hit from this, but has started to rise again. It is being produced more and more and other companies are starting to craft well made Genever. Genever can vary from oily in texture to having fruit forward flavors. It’s traditionally made with a rye and barley mash. It’s 100% malt with no neutral spirits. It’s smooth, aromatic with a malty flavor. Sometimes it is aged in wood for a few months to a few years and comes out as a pale straw yellow color. The 2 year old Oude is usually aged in Bourbon Barrels. Bols currently makes an aged Genever that has rested for 18 months in French Limousin oak casks. Originally created due to the lack of grain in World War I. It contains more grain instead of malt. It can contain no more than 15% malt wine to 10 grams of sugar per litre and be atleast 35% ABV.